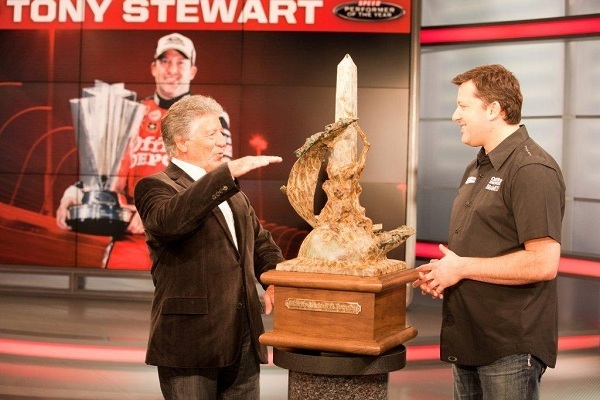 Racing legend Mario Andretti presented his namesake trophy to NASCAR Sprint Cup Series champion Tony Stewart on SPEED Center earlier this evening, acknowledging the three-time champion’s Chase run as the difference maker among a very impressive field of finalists for the annual SPEED Performer of the Year presented by ACE®. Five of this year’s seven finalists received first-place votes, including Stewart, runner-up Casey Stoner; AMA Supercross/Motocross champion Ryan Villipoto; last year’s SPEED Performer of the Year, Sebastian Vettel, and USAC/WoO phenom Kyle Larson. The award, now in its sixth season, is presented annually by SPEED to the racer who puts a premium on winning races, shines on motor sports’ biggest stages and does it all with a measure of sportsmanship and class. The 2011 SPEED Performer of the Year was selected by a panel including racing legends Andretti and Dan Gurney, “Wind Tunnel” host Dave Despain, veteran broadcasters Varsha, Ralph Sheheen and Leigh Diffey, SPEED.com writers Robin Miller and Tom Jensen, versatile racers Tommy Kendall and Dorsey Schroeder and a select group of SPEED motor sports producers. The trophy, a true work of art created by bronze sculptor Elie Hazak, stands 38 inches tall and weighs 95 pounds. It features eight cars, including six of the most important in Mario’s rise to superstardom, as well as an array of artistic symbolism that captures the essence of the trophy’s namesake.